Improving ticket sales and subscriptions for a well-known Chicago theater institution. Mightybytes has been a key partner to Court Theatre in establishing and then updating our professional presence on the web. Their team really got to know our organization by conducting patron research, meeting with key constituents, and working with a complex ticketing system. The resulting site is easy to update, serves multiple constituents well, and has significantly increased online sales. Over the course of ten years, Mightybytes has helped this popular Chicago theater build community, create engagement, and drive significant increases in subscriptions and ticket sales. Mightybytes first started working with Court Theatre, part of the University of Chicago, in 2008, when we redesigned their website to help site admins easily update information about upcoming shows and archive historical runs. Several years later, we designed and built a site add-on to help them more effectively create microsites that promote new productions. 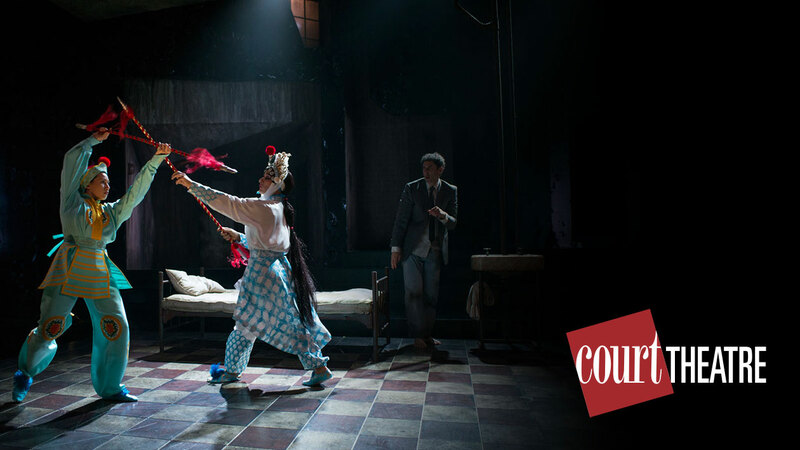 In 2016, we partnered with Court Theatre again to give their website and its ticketing system a complete overhaul. After many years of adding site content, information was difficult to find, often buried several levels deep in a navigation that no longer suited user needs. An off-the-shelf, third-party ticketing system gave a slow and, at times, confusing ticket-buying experience. Also, the website’s university-mandated hosting system made the site slow and unresponsive. Analytics data showed that these things caused user abandonment and loss of ticket sales. 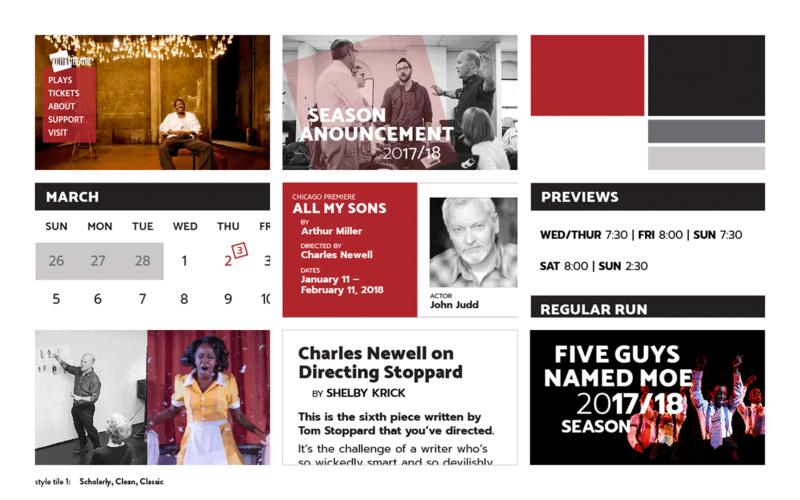 Styles tiles, based on Court Theatre’s existing brand standards, drove the new website’s visual design. 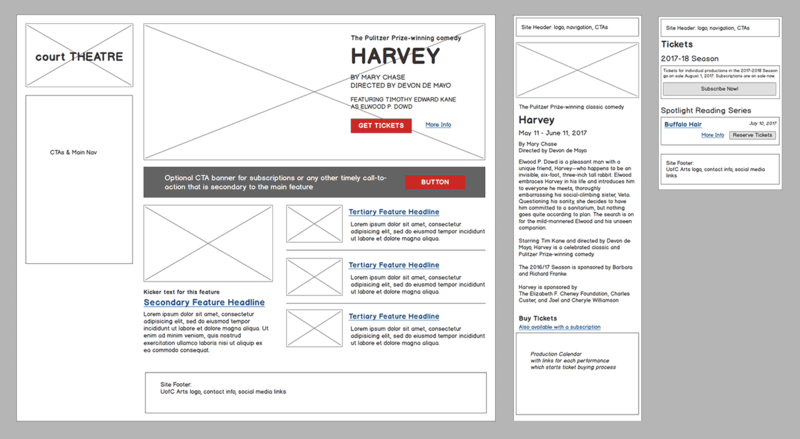 We created wireframes for several content and page types and display sizes to build consensus on layouts. A critical component of this new project was to integrate and optimize their third-party ticketing system, specifically the user experience when purchasing tickets, subscriptions, or making donations. By improving the ticket-buying experience, we were able to improve the rate at which site users became customers. Since launching in early 2017, Mightybytes has worked with the team at Court Theatre to continue improving their new website’s functionality and, through analytics configuration, content/SEO analysis, and sales funnel mapping, support the theater’s digital marketing strategies. These efforts help the Court team stay focused on improving key digital metrics that drive organizational success over time. The theater website is also hosted and maintained using our basic maintenance service for improved performance and security. Court Theatre has seen significant statistical improvements in their first year since launching the new site. The organization saw a 443% increase in online subscription sales over a single year. Online donations increased by 155% the year after launch. Single ticket online sales were 18.3% greater in 17/18 than in the 16/17 season. Online orders of group sales (10 or more tickets) were 87% greater in 17/18 than the prior season. Total site traffic, including new and returning visitors, doubled in the first year after launch.